We had a nice weekend, Saturday morning Jan had to work, but then he was free the rest of the weekend. It was still nice weather, although much lower temperatures. We even had a thunderstorm yesterday evening, with lightning and thunder and even some rainshowers. There isn't too much to tell, well, nothing real special, although there is something I can tell you from the Olympics. We have won two medals there, a silver for the swimming team on the 4x100 mtr. freestyle estafette for women and a golden one on the cycling event for women, on the road. Marianne Vos was of a special level there, really a worthy winner of the event. We did watch a lot of the Olympics, and did you see the opening ceremony on Friday evening??? I found it amazing and wonderful, specially the 3 first parts . Wow, the Brits had really used their imagination and skills. I had a great time watching it. 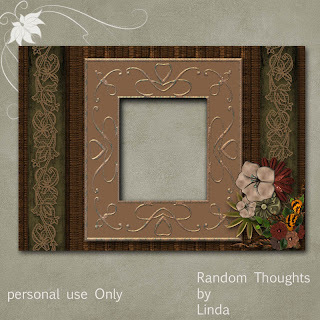 This morning I read the blog of Edna and she had some wonderful news!! 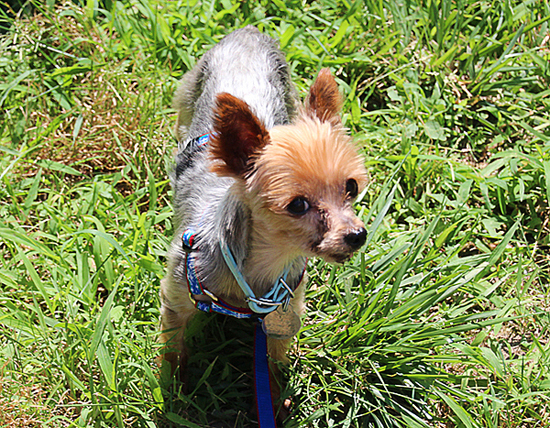 She has a new dog in her life, named Pogo, the sweetest little tea-cup Yorkie you could wish for!!! She has some pictures of him on her blog, but I cannot resist showing you already one of them. So meet Pogo, Edna's new companion, and I hope they will spent many wonderful years together! My friend Edna has given me an award, which I have to pass on. Thanks Edna, of course, and now the hard stuff: obeying the rules, which are not as easy as you should think.! 2) Name 5 of your most fabulous moments, either in real life of in blogsphere. 5) Pass it on to 5 other bloggers and let them know by a comment. Winning the pianocompetition from all schools and playing with the Residentie Orchestre in a big hall. A helicopter flight I made with my parents over the Caucasus Mountains. Of course meeting my Jan and still being together. My wedding day, specially the fact that my niece from France came over, and here husband who made a great photoshoot of the whole day, being the only family present on that day, I will always be so greatful for that. 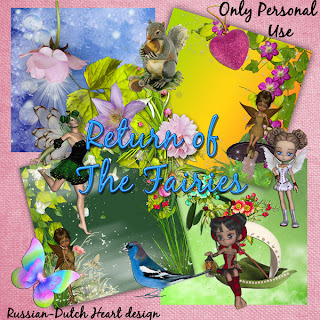 All things of nature, curled up cosy on the couch, watching a good detective, cooking, the designing of scrapkits, and all things creative, my pets, all friends I've met during my life till now, of course the blogging, which opened another world to me,. Dishonesty, intolerance, discrimination, touching worms when I work in my garden (yak), see people around the world who have hunger and diseases and knowing that that shouldn;t be necessary, the terrible way some people treat animals. Hey, I've done it, rofl! 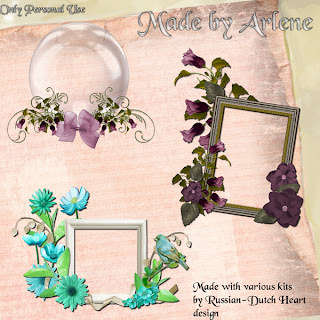 From arlene I have various clusters, made with various kits of mine. And there is a kit for you too and after that it will be time for me to slowly get busy around here, some things I want to do before Jan gets home again. 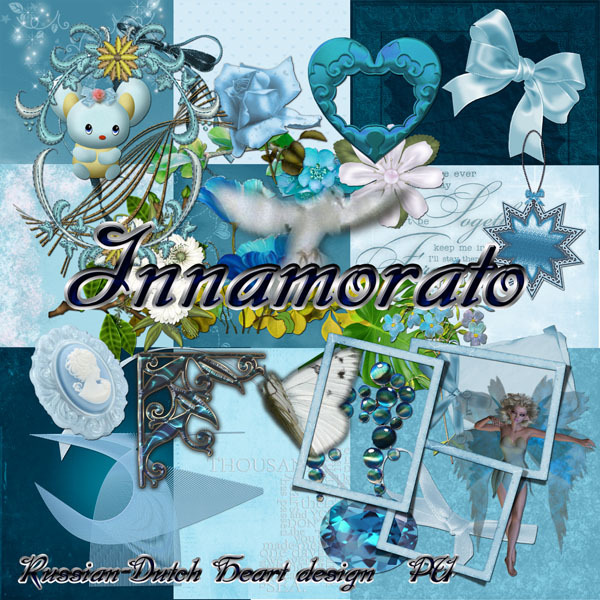 It's a one colour scheme kit, named Innamorato. Have fun with it. I am very early, it's only 7.30 am, and Jan already left the house to go to work. Today is a double shift again, Morning till around 12.00, and evening shift from 5.00 till 10.00 pm. So you could say I am kind of single today, partially LOL! Good time to do some shopping this morning, and taking care of some disorder here. Oh, Wednesday was a pretty succesfull day, when Jan was working, I did my blogpost and then did the dusting and vacuum cleaning here. Also changed the bedsheets, which filled the washing machine, so turned that on, and in the mean time I went out to get us a new program magazine for the tv and bought us a part of a watermelon and a Cantaloupe melon for desert. ( it's nice to change for a moment, we had a LOT of strawberries lately). Back home again, I thought it was a good idea to clean out a rack in the storage room, it looks much better now, still some more to do, but it's a start. Almost finished, Jan came home, and I only hanged out the laundry and thought it was enough done for that day. Jan also had an evening shift that day, so had to make something for an early dinner. He left around 16.30 in the afternoon, I did some things on the computer and suddenly had trouble to keep my eyes open. Why torture myself??? Hopla, I went to the couched and had a real good nap of about 1 ½ hour! Yesterday was a lazy day, didn;t do almost anything. Only in the afternoon I went to Heidi's house to feed the fish and that was it. There is always something to do in the house, but I know I have to restrain myself sometimes to do not too much, (not that I don;t like that ROFL), but I have to do that, otherwise I will notice it some days later. If I am too energetic for days in a row, oops, I am having a chance to get a warning from my epilepsie, mostly some very mild absences, but that isn;t nice. Better to try to avoid it as much as possible. Probably we will have the last real summer day today, they announced weather change again. It never can stay very long the same kind of weather here. Very frustrating. There might be a temperature drop of an 8 degress in one day.! 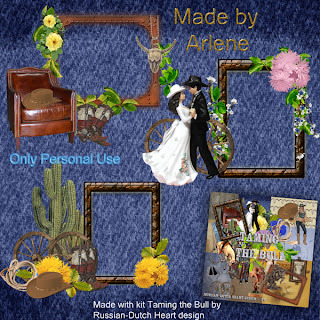 I did finish another kit yesterday, they come a bit slowly at the moment, so I am glad another one is ready to be uploaded. 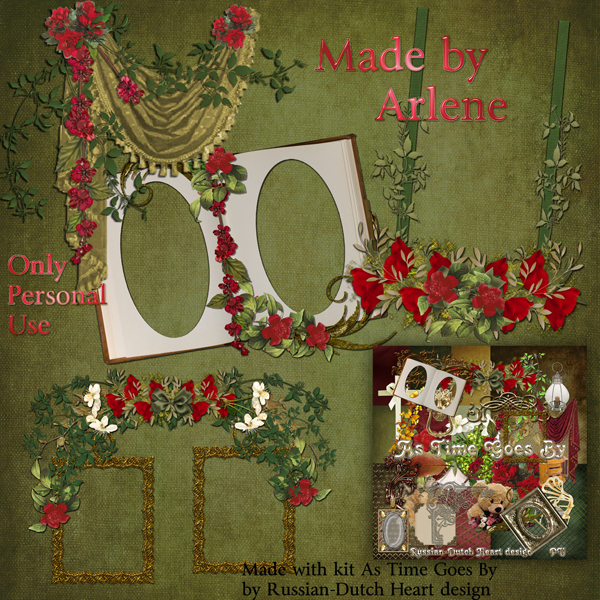 I have today two clusters and a quickpage by Arlene, made with the Attic chest kit. And I have a very romantic and vintage looking kit for you, named "The Romantic"
Almost off now to get busy, well, first another cup of coffee, then hop into some clothes and then to the supermarket for just a few things( like cat food, that is disappearing as snow in the sun, LOL). And I think this afernoon as early and quick dinner I could make a patty with ragout, not too heavy on the stomach, as Jan has to work again this afternoon/evening. Hmmmm, I think it's a good idea, we didn;t have that for a long time. Time to move around, so I wish you all a wonderful weekend! It was a sober but emotional day on Monday, when we said goodbye to our friend Bert. Thank you all for your sweet messages, and prayers and thoughts concerning his passing away. And daily life knocks again on the door, we just have to keep on going. It's gorgeous weather here the last couple of days, which is nice for Jan too when he has to ride his bike. Oh, poor thing had a double shift on Monday, one in the morning and one in the evening. The morning shift was a smoothly going one, but the evening had some trouble. Not because of annoying patients, not even because of some addresses he couldn;t find, but a bad planning from the health care institution. They sended him back and forth, plus he had to return a key which took him about half an hour, just because they didn;t tell him he had to leave it at the house(he had two clients in a home for elderly). In short, he had to work till about 10.00 in the evening but only was back home just at midnight. Well, they will have to pay for extra hours, because it wasn;t his fault! Good thing he had a free day yesterday. While he was taking a nap at the couch, I went to do a bit of shopping, and got the luminous idea that we could have a little barbecue, just the two of us. It was such good weather, that it was a perfect day for it. So I bought a ready-steady little barbecue, some chicken wings, some other meat, bit of salad and French bread and we had a great time in our garden. Today Jan has a double shift again, so I don;t want to spent too much time at the computer this morning, cause I want to do some things here. Dust is crying out to me, that it needs a vacuum cleaner, and I also have to change the bedsheets. 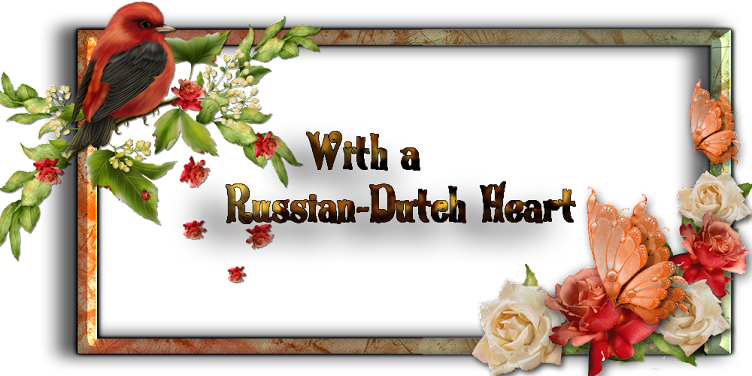 Then I will have to prepare an early dinner, cause Jan has to leave this afternoon at about 16.30 again. 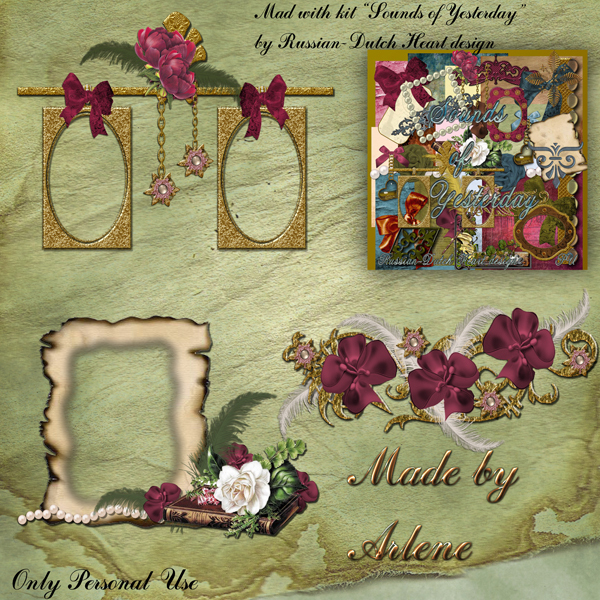 I told you Friday that Mindy is back on internet again, and I was so happy with it, that I made a small fantasy kit for her, to offer on her blog. 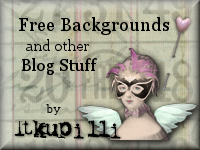 Here's the preview, if you like it, go to Minky's things to download. Attic Chest kit. 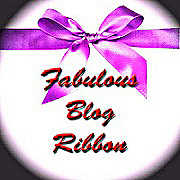 Go to her blog for download. 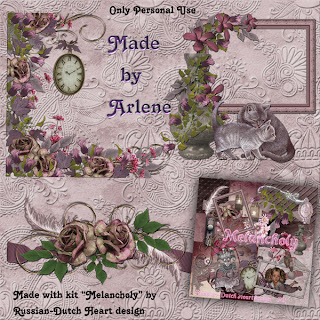 And I just got a mail from Arlene, that she is doing better, although she still hasn't her voice back. But she did send me some clusters and a quickpage with the Attic Chest kit, beautiful as ever. 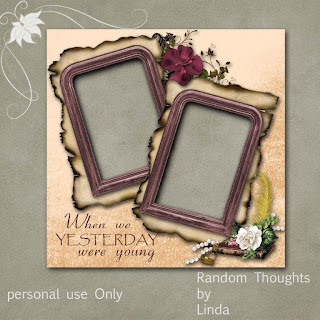 These are not for today, I have some clusters for you made with the Sy Feeling kit. And of course I too have something, LOL! 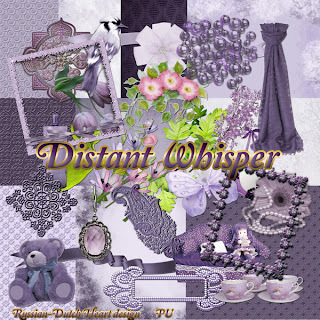 A kit in lavender/ purple, named "Distant Whisper". Posting on an unusual day. This will be a short post, already today, instead of tomorrow, because tomorrow I will have not too much time for it. Friday evening we received a card in the post with the sad news that a good friend passed away. It's the one I think I already wrote about a couple of months ago. He had cancer everywhere in his body, and it weaked him so much that he had a heart attack last Tuesday. In a way it was a good thing this happened, so he didn;t have to suffer too much, and died at home in the arms of his wife. But still it's another member of our close group of the old cafe, we celebrated many birthday, wedding, christmas parties together. Tomorrow will be the funeral service, so you can understand I will not have a lot of time and will not be in the mood either. It really influenced our weekend, this event remained all the time at the background of our thoughts. Bert was the one who wa so proud to drive the car on our wedding day, almost 5 years ago now. I hope, he will be at peace now, without any pain, in a wonderful free world. So if you don;t mind, I will just post the freebies now and finish the post with it. Wednesday I will be back, and ramble along as usual. From Arlene, beautiful clusters from the Fresh Look kit. 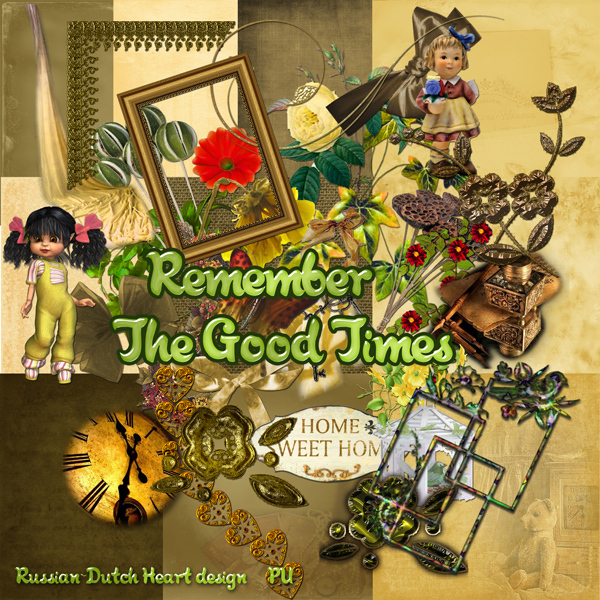 And from me a recently made kit, strangely enough with a title that comes together with the passing away from our friend, "Remember the Good Times". All real quiet around here and early in the morning. Yes, Jan is working again in the morning. And Sunday morning and Monday he has even two shifts, one in the morning and then from 5 p.m. till 10 in the evening too! That's more like it, and hopefully it will stay that way the next months! The leak isn;t handled yet, it seems. Yesterday we had some rain showers and we had a small share of it inside the kitchen again. Not as bad as it was, but it's still no good. I guess Jan has to go to the neughbours again this afternoon. Some day it will be dealt with(I hope). As Jan is the working party now in our little family LOL, I'll have to do my share at home, at least, I feel it that way. So I get busy the times he is working, with all sorts of things a house needs, and I try to put on a tasty dinner. Wednesday I made tagliatelle, with a creamy suace and little pieces of broccoli and chopped tunafish, and tomatoe salad to it. It tasted good, but pasta isn;t Jan's favourite food LOL. But it makes a nice change from the potatoes, meat and veggies sometimes. So yesterday I made a greater effort and we had chicken breast filet, filled with some salami and camembert, simple boiled potatoes and fresh spinache leaves, fried in a bit of oil, with some chopped onions and garlic to it. And as desert an apple out of the oven, filled with some buuter with brown sugar and raisins mesh, bit of cinnamon to it and when ready some whipped cream over it. It was yummie. Now Friday is generally a "free"day, concerning the cooking LOL! Jan makes something himself and me too. And you'd be surprised what the result of it can be sometimes. The most strange combinations of things, but wonderful. Also had some news about Arlene. Not only she had to deal with her flu, but she has a sinus infection too, the poor thing! She is on anti biotics and is feeling a little bit better. I told her to take care of herself first and then think about some new clusters, but she dragged herself to the computer LOL and sent me wonderful things again from the last few kits. 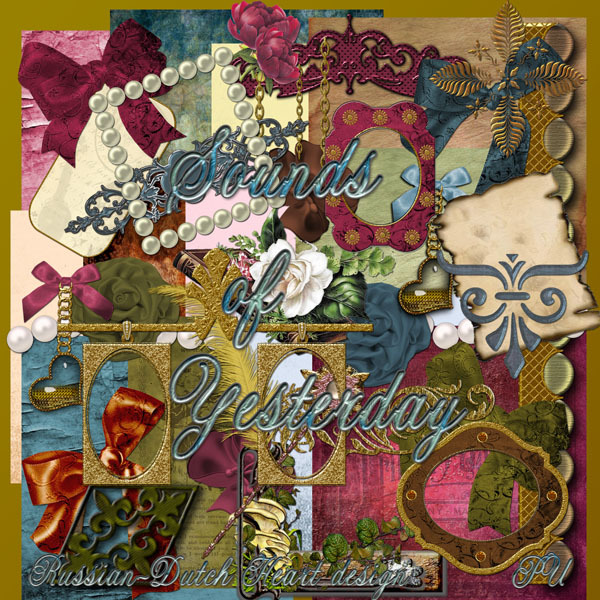 Today some great clusters made with the Sounds of Yesterday kit. Oh, I just remember that today is again fish feeding time at Heidi's home!!! Pffffff, good that it came into my mind. Not that it would hurt them to wait another day, but it's better to go there every other day. Well, with that in mind I should hurry up a bit, if I want to do that too this morning, before Jan gets back from work. Today the last part of the Attic Chest kit. And then may be I will have some inspiration this weekend for another "regular" kit and something fantasy for Minky's blog. Whee, busy times arrive again ROFL!!! Well, have a wonderful weekend, all of you and we'll meet again on Monday. Yeah we had another leak. This time it was in the kitchen. I notice already for a couple of days a strange appearance of water, near the sink in the kitchen. First I thought it was coming from dripping off of the dishes etc. So I whipped it dry, but then it came back. Didn;t understand where it came from, called Jan, mounted myself on the worktop and saw that it was comping from the corner in the ceiling, dripping along the wall to the side of the worktop, which is also near a little window. That was the last thing we needed now. Jan checked outside and according to him it was coming from the balcony from our neighbours. Possibly they have no good enough drain pipe there, and when it rains like the last couple of days, there stays too much water on the balcony. Then you only need a bit of older wall, with some cracks in it and hoorray, you have extra water in your kitchen. So Jan went to speak to them, explaining the problem, hopefully they will take care of it. Because now that it isn;t raining anymore, it's almost gone. But we have to be sure it stays that way!! I was kind of lazy the last two days, yes, I am ashamed to say so LOL. Well, I did some things, like a bit of grocerie shopping and ironing, but was also busy on a new kit. Hmmm, that has to change today. One good thing, Jan is gone to work this morning so I have the morning "free". I think the room for certain needs a good vacuum cleaning, and there are some more things waiting to be done. With Jan out of the way I am allways far more active, so I should take advantage of that fact. GRIN! 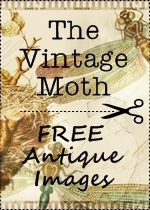 It seems the weather is very slowly getting a bit better again, and I think it's about time. Temperature is still bearable, but we had a lot of rain. Probably it is the wettest July in years! Now there is only a lot of wind today, which is a pity, but okay, if that is necessary to drive away the rainy weather, so be it, for one day I hope.! Also I must not forget to go to Heidi's house, to feed the fish. Jan did that on Monday, so now it is my turn again. We dodn;t need to go there every day, just every other day is enough, fish are easy! 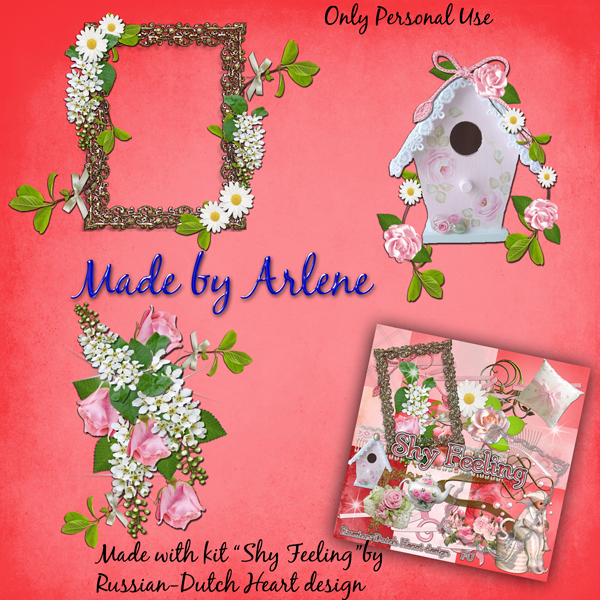 I have some clusters for you from Arlene. I am a bit worrying about her, because I didn;t hear from her for some time, I think she is still struggling with her flu and then also has to deal with the health problems( to say that mildly) of her sister. I think she must have a rather stressing time at the moment. 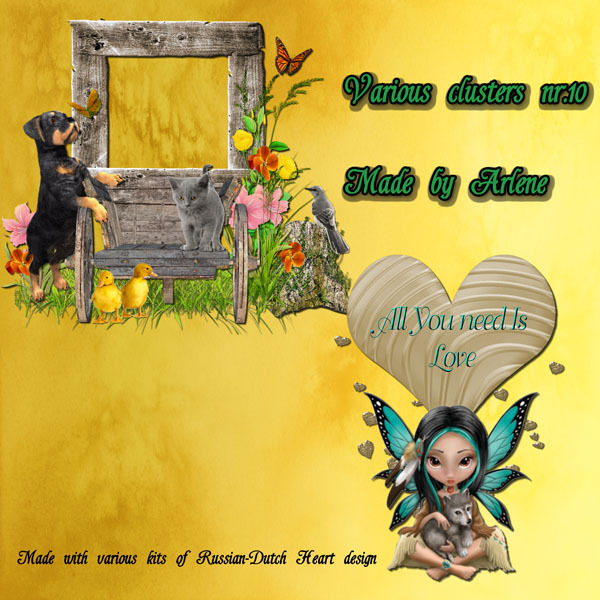 The clusters are made of a mix of several of my kits. I think they are just lovely! 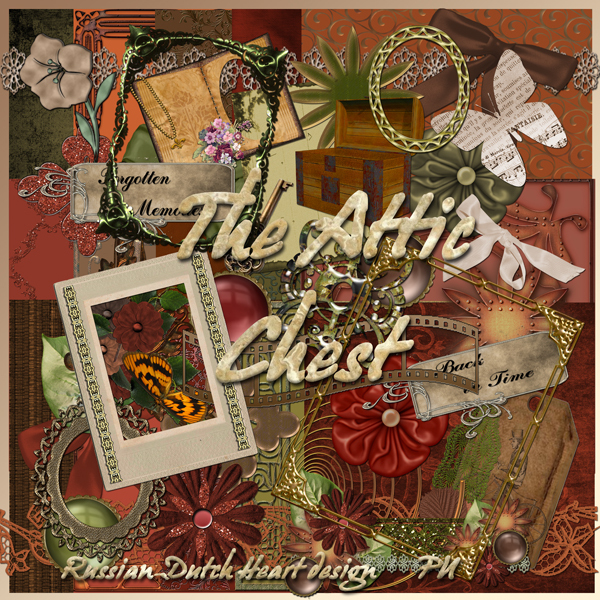 And there is the second download from "The Attic Chest"for you. I have still a moment to be lazy and then have to get moving to get things done before Jan comes back from his morning shift. Friday morning I told you Jan had to work. So I took advantage of the time he was away to do some stuff around here. And he came home all smiling, cause his shift has been an easy one and even kind of cosy. He even had time to have a little chat with some clients. The afternoon we had planned to go to the market, but as the weather was so bad, we skipped that idea. It was raining almost all the time. Then late afternnon the phone rang and that was Heidi, telling me they were going on holiday that evening, hahahaha. She though she had mentioned that already to me, but no way! So it was good she made that phonecall. Now we knew we had to check on their house and feed the fish, hahahaha. The rabbit and bird have passed away, as well as their goldfish, so they have a tiny little aquarium now. (and the doggie of course, but he is going with them). And Satuday afternoon I went over to give the fish some food. It is easy to take care of them, just every two days a bit of food. On the way back I bought another pair of reading glasses for Jan. You know, that cheap one you can buy almost everywhere. Yes, he already has one pair, but he liked to have another one, to have permanently in his bag when he goes to work. And if possible also in a firm cover, so it wouldn't bent every time he makes a move LOL! I just had seen one in a shop and so he is the proud owner of two pairs of reading glasses now ROFL. It just was € 1,89 all together. Amazing that they can make it for that price. Yesterday I just did nothing!!! Well, no rummaging or cleaning or that kind of thing. Just spent time at the computer, in the garden and on the couch. Wonderful! Today however there is need of some action. Not too much but I need a few grocerie things, then some attention might be given to laundry (ironing) and perhaps a quick sweep with the vacuum cleaner. And if weather stays reasonable, we might go to the market today. I hope it will stay dry, and it would be better if it wasn;t so windy. Oh ad not to forget the feeding of te fish, this time it's Jan's turn. That was the weekend in a nutshell. Not really interesting, but as a lot of people probably have spent it, or something like it. Sometimes I really am desparate of what to eat for dinner. You easily stick to some same things, but I want to try to have a bit of variation in it. Yesterday we had chicken filet, normally I make it filled with salami or ham and mozarella cheese, but this time I cut the filet open, filled it with lots of pressed garlic, some lemon juice to it, some pepper and salt, closed it and wrapped it with slices of bacon. And prepared it on the oven. Turned out well, but I think we had an aura of garlic smell around us for hours LOL! Together with baked potatoes and a tomatoe salad and strawberries with cream as desert, we had a more than good diner. Time for the freebies now. 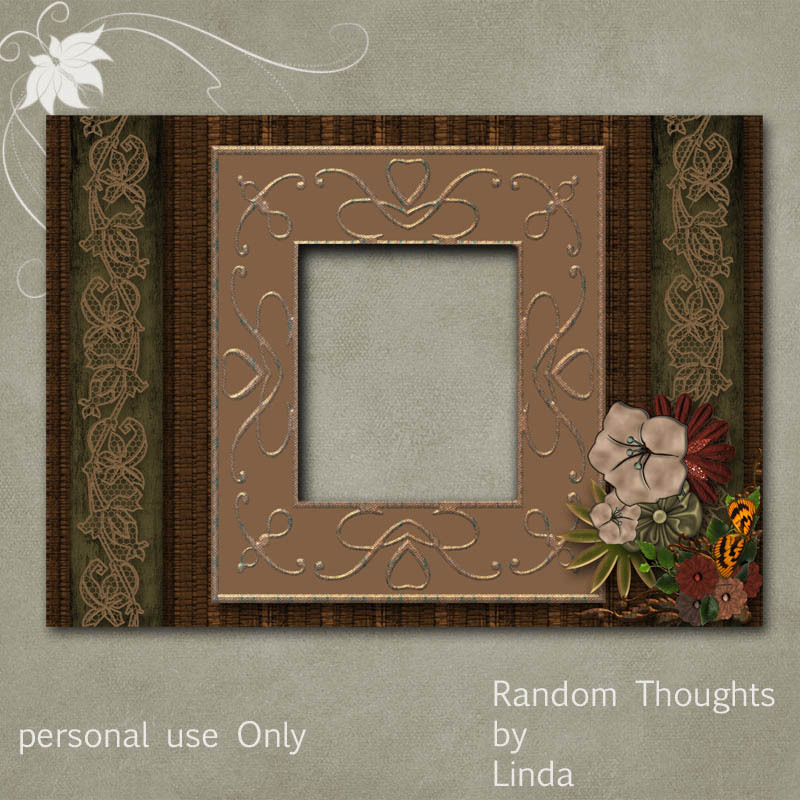 First a wonderful quickpage by Linda, made with the "Sounds of Yesterday kit. You'll have to go to her blog for the download. Frome Arlene I have clusters fro the Elegant Wedding kit. And the kit is a rather huge one so I splitted it up in 3 downloads. So that will be for the whole week LOL. As I had a bit of trouble with Mediafire on a time I wanted to upload, these downloads are via 4-shared. I know many of you don;t like it, neither do I but normally it should work okay. So bear with it, and next kit will be again on Mediafire. Here the start of "The Attic Chest", preview is of the whole kit, in every download you will have some papers and elements. P.S. It seems some of you have trouble downloading 4-shared, so I re uploaded the files to Mediafire. I get things done, whoopie!!! Wednesday morning, Jan went to work, he started in rain, but I was happy for him that after about an hour it stopped and slowly the sun came through. During his shift I did my bogpost and then also got things done in the house. Did thourough dusting and then gave a sweep with the vacuum cleaner, and even tried to clean the carpet. Well, not the whole one, but on several spots there were little stains, and they didn;t disappear completely, but it looks much better. Jan came home around 1.00 p.m.and had an easy shift, even had time to have a chat with another health worker, so he came home with a smile LOL. In the afternoon he took a nap on the couch, and while he was sleeping I did some shopping. Yesterday there was no shift for him, so he could sleep longer in the morning. And as we together hang the doors back in the closet the evening before, I could hang back the clothes. And I took advantage to re-arrange it and went through the baskets with Jan's socks and underpants. They look much better now, we removed the old or damaged ones, I also did part of another closet, and was all happy about myself LOL. Today Jan is working in the morning, but I didn;t hear the alarmclock, so I woke up around 8.00 o'clock, cause Jan probably was awake before the alarm started and he left me sleeping, the sweetie. He doesn;t has bright weather, it is raining again. Weather isn't real summer one, hopefully it will be better next week again. Jan at work, gives me time again this morning to do some things around the house, I don;t mind, it works easier when he isn't around, and you would laugh if you saw me busy with things. I put on some nice music and swing around doing household LOL. Tomorrow morning Jan has again a shift till midday, and hopefully they will give him one on Sunday too, cause weekend shifts are payed extra. 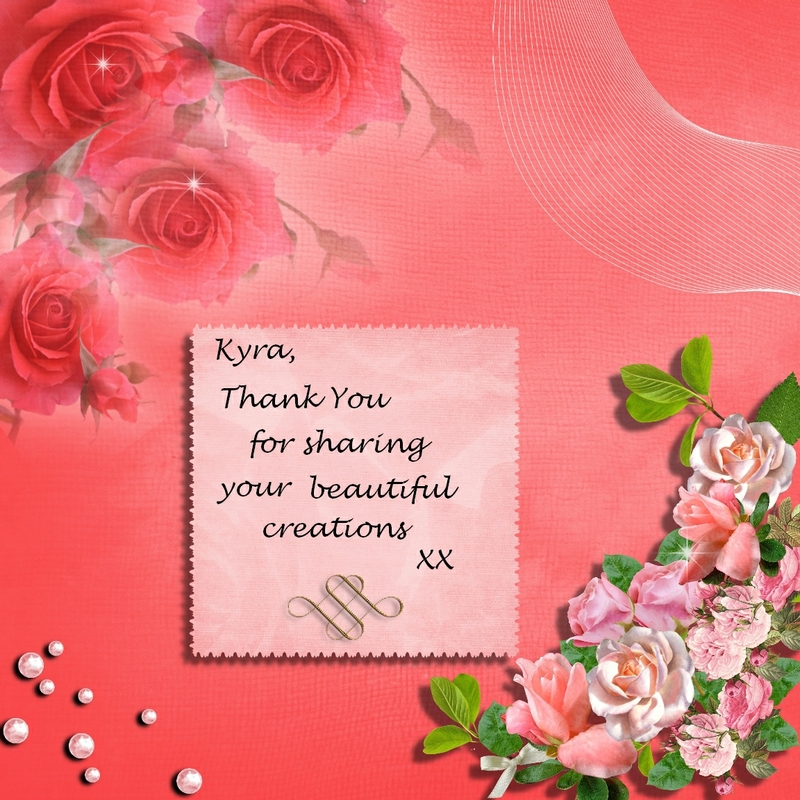 I had such a sweet mail, from somebody thanking me for my kits. 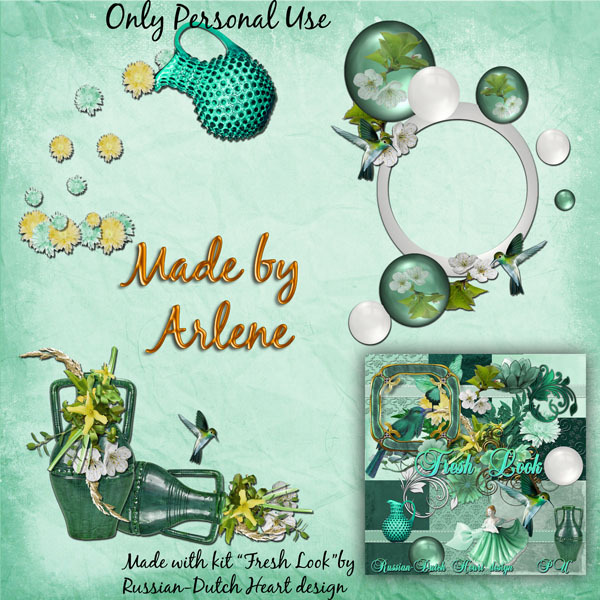 Today I have some various clusters from Arlene, she used a mix of several kits of mine. I will try to post the My Freebis for July this weekend. 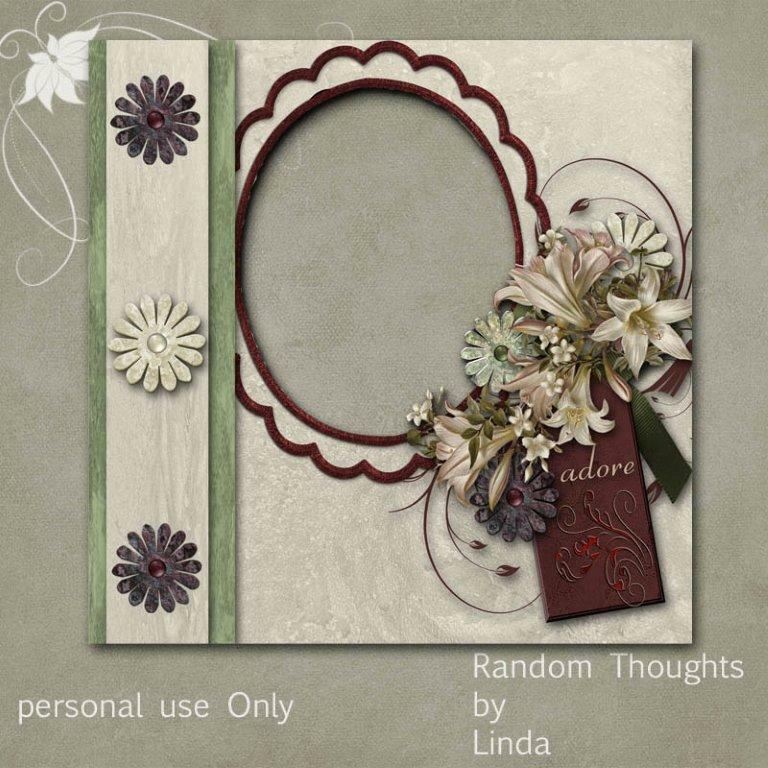 I'm happy creativity is coming back a bit, I did finish a kit yesterday and even started on another one. But today I have a kit I've made some time ago, I think I didn;t offer this one already. If I am mistaking, please let me know and I will post another one. It's named "Somewhere in Time". Oh wow, I had a message that this one was already posted, so I will change the kit for today. Sorry for the mix-up. 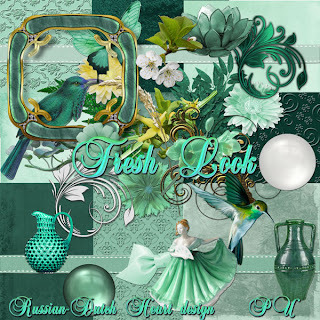 So here's another kit, named "Fresh Look"
Okay, time is running, must hurry to get dressed and realise my plans for today, before Jan gets home. 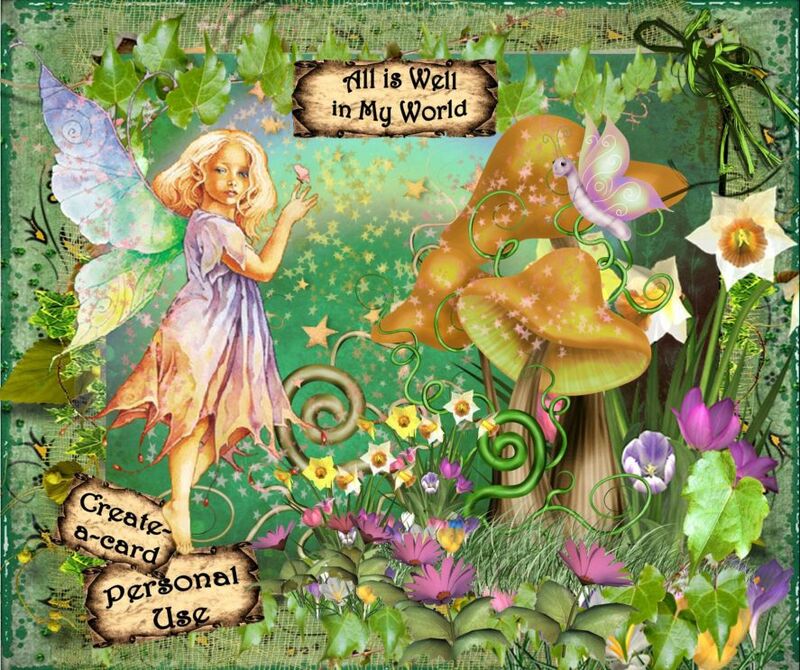 Have a marvellous weekend and take care! Summer is a bit far away! Yeah, weather has changed somewhat. Temperatures are not great, although it isn;t really cold. 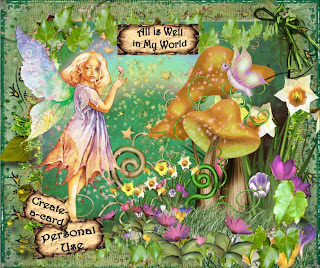 But it's raining more and more, lovely for garden and farmers, but we don;t need that amount LOL. I think Jan did catch a little cold, cause the last two days is wasn;t feeling 100%, and he did spent overtime on the toilet poor thing. It's better, but not over yet. And this morning he had to work, so I felt sorry for him, the more because it poured rain. And still is raining. He has a rainsuit for on his bike, but it's no fun to be riding in the rai and getting wet and then arriving dripping at the peoples door. And wind is also coming up, so I am glad he only has to work till 12.00 o'clock. I told you about the misunderstandin about his shift last Sunday morning. Well, he went to the agency on Monday to explain and it was their Fault(or of the institution that wanted help). Anyway, he gets payed for 3 hours work plus extra percentage because it was a Sunday. I always must laugh when, like today, it is raining and I take a look through the kitchendoor window. Because I see our two cats sitting brotherly together at no distance at all from eachother, sheltering for the rain. (We have a balcony from the nieghbours just over the entrance of the kitchen door, so it's a nice dry spot). And they can look soooo pityfull, like real actors. People looking at them could think, they are not allowed into the house, that we are real harsh on them LOL! Which isn;t true, because they can enter through the cat-door. I did get another kit done, slowly creativity is coming back. 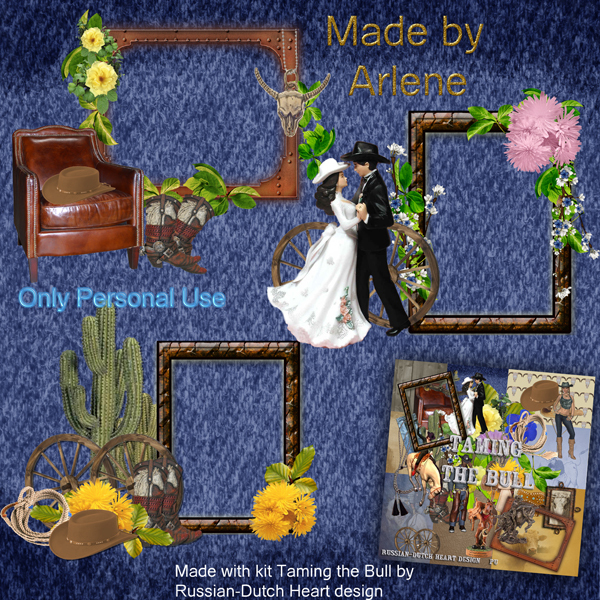 Just got mail from Arlene, who sufferes too from creativity loss, grin, grin. But she also has catched a flu this weekend, all is acking, soar throate etc. And still she managed to make a few great clusters.! Now I want to do some stuff like vacuum cleaning, getting rid of some dust here and there, before Jan is home again. So I better hurry up, and finish this post now, hop into some clothes and get busy. 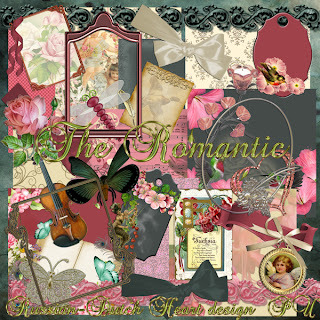 I found some wonderful color pallettes on the net and this kit I made of one of them. This is a pink one, named "Shy Feeling". Misunderstanding or just a fault??? Friday was a lovely day, weather wise. But also otherwise. We didn;t do too much, but tried our hands on one thing though. We have our big closet, in the backroom, where we have almost all our clothes and the bedwash and some other things. But one of the doors plopped out of one of its hinges, so it had to be fixed, before an accident could happen(like me openig the door and the bloody things coming out of all its hinges and dropping on me LOL). Then Saturday also was great weather, but Jan had to work. First just a morning shift, but later in the morning he phoned me to tell, they asked him for the afternoon too. Well, it brings money into the pocket, and it was great weather, so he accepted. I was glad he came home at time, around 17.30, but still he was a bit tired. I made us some hamburgers( made them myself) on buns. We spent the evening on the couch watching some great detectives and went to bed not too late. Jan had to work the next morning too. So when he left that morning I first did some things on the computer, and just when I was almost done with that I heard some noise coming from the entrance door. And when I decided to have a look who came into the room??? Jan! They didn't have him on the list ! The department of house care even did phone around for other locations, but no, his name was nowhere on the list. Still he was booked by his agency for that morning!!! Well, if it is their "fault", he gets payed for the hours anyway, but it is strange. So he will go there today to ask what happened. Still the whole day was a bit mixed up, because you wake up rather early, expect some working hours, and then ...........nothing. Can you guess what we did a bit later that morning??? Yeah we took a nap, oh how lovely! LOL. On to business now. 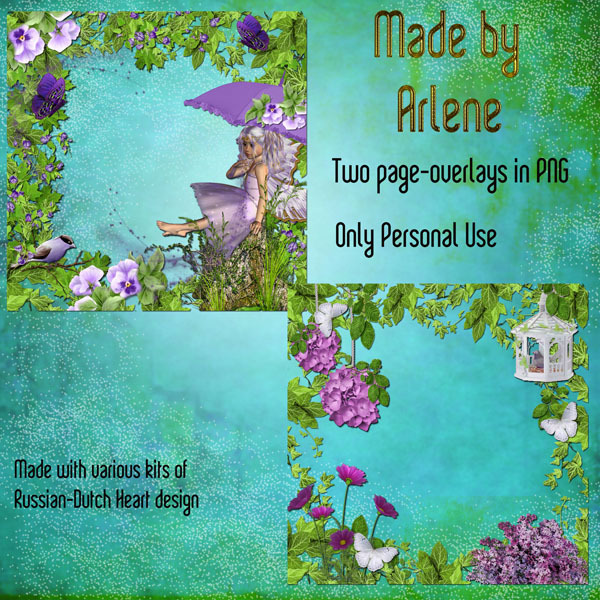 Lovely clusters for you from Arlene, thiese made with the "As Time Goes By"kit. They really look great, hey? I LOVE the swing she made. And a kit in a bit nostalgic "shape", named "Sounds of Yesterday"
Golly, I was sound asleep! After another gorgeaous day yesterday it is still a bit raining now. Jan just told me, that during the night we had a serious slpash of water coming out of the clouds! It rained so hard, that in no time the street was drowning. There also was some thinder, but most of all lots of lightning and even hail! And I didn;t notice any of it LOL! But some plants are flat now, bevause of the hail. Hmmmm, we'll see what we can do about it, when it's dry again. Wednesday was a lovely day, really summer, and in the afternoon I did make a short visit to Heidi, to bring the present for Danny. We had just a little chat, Séverine was at home(she has school holiday now) ad she sowed me her schoolreport. She has done very well!! !They don't give figures anymore, like we had in our time(see, I am getting old, talking about "our"time LOL), but she had all from good to more than good and even excellent. So I was proud of her. Jan went to the market and came home with a sac full of apples. We often take one in the evening and they taste real good. Yesterday I went out for a little shopping(and even forgot a few things, dummy me) and catch just a few drops of rain. Not enough to get wet. Home again I first took a sandwich and then did some serious work. I washed the curtains from the front window and also washed the window. Glad I did, it wasn;t yet too dirty, but you ca notice the difference. And I still have to do the outside of the window, but hadn't the courage to take out the large ladder and all. Jan took a little walk in the meantime and when I was ready with the window and vacuum cleaning, I burned a cd with some music I downloaded. We still have to listen to it, always curious if it's okay. Then I had a real problem for dinner. Couldn;t decide what to make for it. Had no taste in meat, potatoes and veggies, so I made a filled omelet. I filled it with mushrooms, onion, courgette and ham, gave some green salad to it and as dessert a little bowl with strawberries. I must say, it tasted good! Pity Jan didn;t get any shift on Wednesday and Thirsday, today he planned his day free, so probably they won;t call, unless they have an emergency. But tomorrow and Sunday he has morning shifts again. Hopefully next week there will be some more for him. No idea what we will do today. Might be we take an easy day, I only want to do the laundry, but that's no big deal. First I want to show you a quickpage, made by Linda, with the J'Adore - kit. I think this page is a beauty. 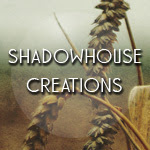 You can go to her blog for download. 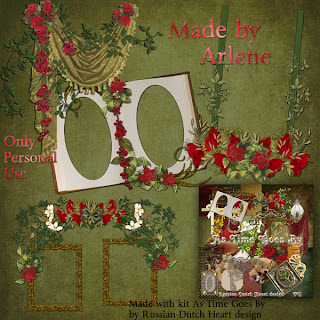 Today I have the Arlene's clusters I showed you already in the layout from Tootsie, made with the "There was a Time kit". And a kit, I have made some time ago, named "Lavender Sweetness". 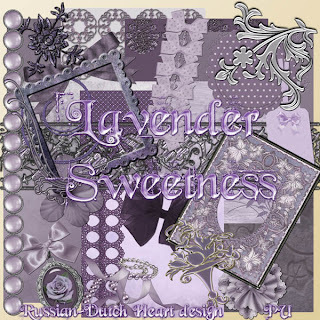 I hope I can finish a kit I am working on this weekend, and may be even make another one. Have a great day and fantastic weekend! I could do with this weather all year. Happy 4th of July,my American Friends! The last few days we have lovely weather, nice temperature, bit of clouds sometimes, but sunshine too, and not too much wind. I can live with that, it may last all year this way LOL. Today is supposed to be the warmest day of the week, so we should do something with it. Well, first I have to do a bit of shopping, and I also should pay a quick visit to Heidi, to bring a little birthday present for her husband Danny, who had his birthday yesterday. At daytime they were at work, so I only phoned Heidi, and I could have gone in the evening, but I don;t like to go out alone in the evening(Jan had to work evening shift). And then Jan wants to go probably to the market, and may be I will go with him. We'll see how it all comes together or not. He also wants to go there, cause they started with the renovation of the market. It takes time, because in the plans it should all be ready mid 2015. I am very curious how it will look when finished. But till then it will be very chaotic with all the work going on. So with all that planned, I shouldn;t take too look for rambling today. If possible I also like to take a moment in the garden, probably around luch time would be a good moment, grabbing a sandwich in peace and quiet LOL. Today I have two page overlays from Arlene for you. She made them out of several of my kits. I have received beautiful clusters from her, but still have to upload them. 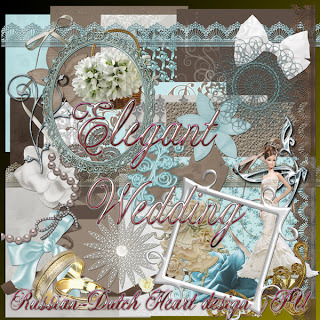 Summertime is often wedding time, isn;t it?So I have a wedding kit for you, probably in a bit different color pallet than usual. It's named "Elegant Wedding". But this kit surely can be used as well for other layouts, because there are enough "neutral"elements in it. As always I start reading some blogs I follow, if there is a new post of course. And I ended up with some tears in my eyes, when I read my friend Edna's blogpost. 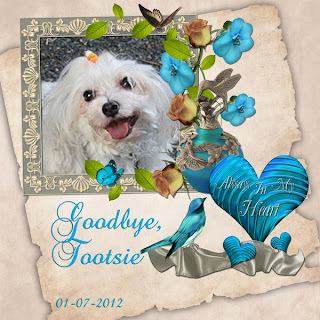 Her cute dog, Tootsie has passed away! Edna must feel very sad, and I totally understand that! This little dog was the sunshine of her life! As we all know, such a day arrives, that we have to say goodbye to our pets, but it is ALWAYS difficult. I've made a layout with a beautiful picture of Tootsie to remember her. Gosh, I am totally confused because of this news. I know Edna will miss this little cutie very much! But let's try to get to every day things. Friday I did some work in the garden. Re-planted a few things, also got rid ofsome plants that took too much space, still have to do that once again, but it was nice to be outside, great weather, and doing something I like. Saturday was a little bit of busy day for me, LOL. Jan had to work in the afternoon and evening, so I wanted him to have something warm before he left. Okay, I was up rather early and started cooking right away, made a kind of stew. That on, I could take my coffee and did some bloghopping in the mean time. Then had to wake Jan, I got dressed and went out to get the weekend paper. Back home I did some this and that, nothing much till it was time to put the dinner up for Jan. That was around 14.45 p.m. He had to leave the house at 15.30 p.m. When he got on his bike I also had to leave, because my ffriend Heidi asked me the day before, if I could take a walk with the dog. They were out almost all day, but couldn;t take the dog with them. So that little doggie was all happy to see me. That took about an hour and then I was home again. I made myself something to eat and then I could sit down. The evening shift wasn;t too bad for Jan, he was home on time and didn't have to difficult clients. Sunday he had a double shift. One from 12.30 till 16.00 pm and again from 18.00 till 22.00. When he was away for his afternoon shift, I took a shower, hopped into some clothes and first changed the bedsheets. Couldn;t get all the sheets into the washing machine, was too full already, so I turned the things on and now the sheets will have to go next time. Did some more things around the house and then watched a bit tv. And oh surprise, around 16.00 Jan was home. It all went easy and as he was not far away he had time to take his break at home. As he left again for the other shift, I got myself something to eat and the watched the soccer finale. And then again Jan was home on time. Yes, that is always a surprise, because you never know how busy his schedule is and if he can find easily all the addresses. Because even with a map at hand, it can be a real puzzle tour ROFL! That was the weekend in short. Today Jan is free, well, almost, he has to go to the hospital in a minute for his yearly checkup. Not a big deal. And as he is in the neighbourhood of his agency, he can drop there his working forms, and perhaps the money will be on the account already end of the week. I had mail from Arlene this morning, containing again wonderful clusters from the latest kits. So sweet she finds time for it, cause they still have no news about her sister. 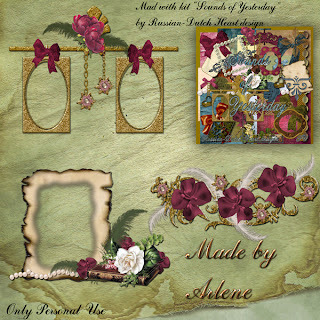 I'll post today her clusters she made with the Melancholy kit. By the way, you have already a little prebiew of her clusters she made with the There was a Time kit. 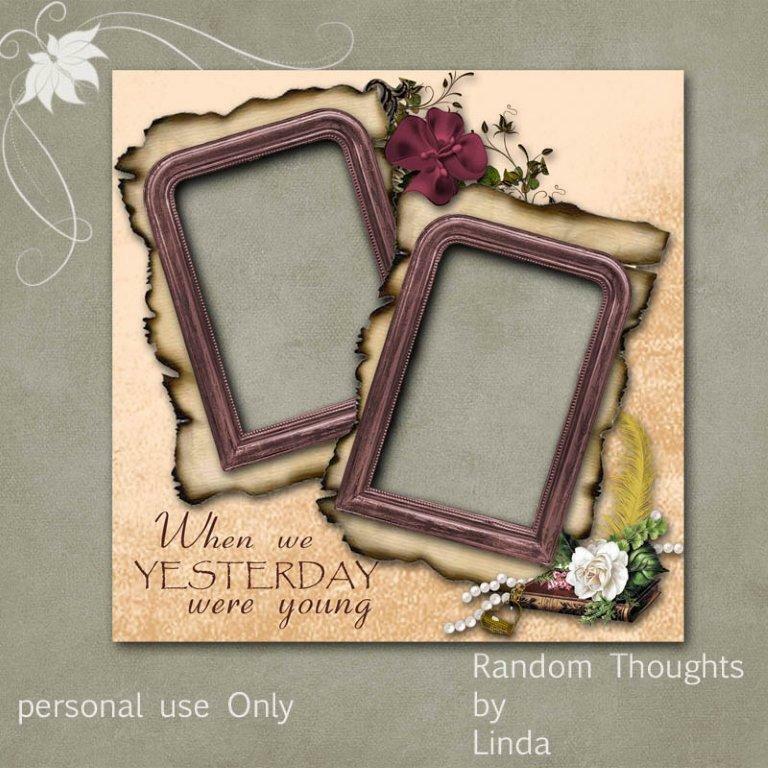 I used them in the layout with Tootsie! 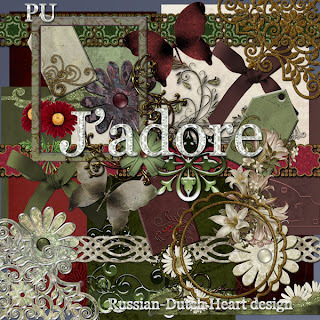 And my kit for you is named "J'Adore". Now I should get a little busy around here, well, after another cup of coffee LOL. Take care, have a great day and perhaps you can find time to leave a little word on Edna's blog, she could do with all the support possible today!